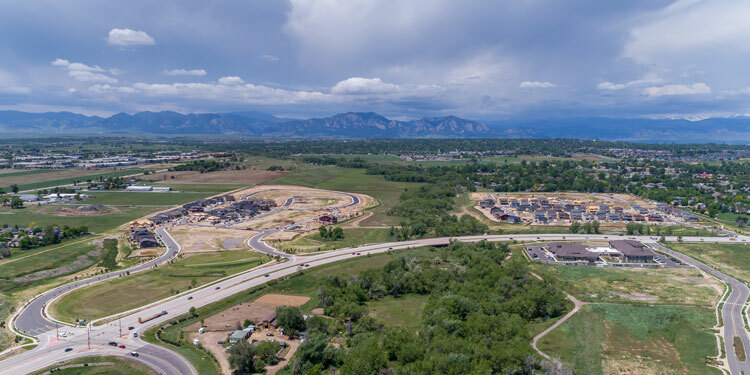 Denver — Ware Malcomb completed civil engineering services for the Trails at Coal Creek, a new home community by Meritage Homes located at State Highway 287 and Coal Creek Drive in Lafayette, Colo. Located just minutes from downtown Lafayette with access to the Coal Creek Trail System, the Trails at Coal Creek community is the ideal setting for outdoor-oriented families in Boulder County. The community is comprised of 317 single-family residential lots situated over 114 acres. With the infrastructure now complete, the new single-family homes by Meritage Homes are being constructed in three phases. Ware Malcomb’s civil engineering services for the project included realigning the floodplain in one reach of the creek and construction of a 60-foot-long pedestrian bridge across the creek. The construction of the bridge improves the trail system and limits the impact on the wetlands. The site included the addition of acceleration/deceleration lanes, left turn lanes, and a new traffic signal on State Highway 287. Ware Malcomb also designed infrastructure to support enhanced handicapped access for the homes. Meritage Homes served as General Contractor for the project. Richmond American Homes is also constructing homes within the Trails at Coal Creek Community.